Orthorhombic anisotropy extends the TI model to allow for azimuthal variations in velocity. Orthorhombic anisotropy is often related to situations with anisotropic subsurface stress, such as in the presence of aligned fracture systems. Due to its relationship to fractures, orthorhombic models are appropriate and useful for land surveys of unconventional resources. 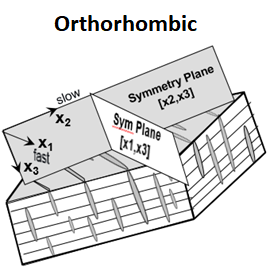 Orthorhombic model parameters may serve as interpretable volumes describing fracture behavior. At TGS, we primarily conduct isotropic tomography. Even for VTI or TTI projects, the anisotropic model is usually calibrated to well data early in the project, then held constant while the velocity is updated to flatten gathers. This will require anisotropic migration, but isotropic tomography is still used for the velocity updates. We do have the capability to perform tomography for TI models, though this is not frequently done. This may be a final resort to help improve well ties while maintaining flat gathers. The offset-dependent picking code is preferred, but a two-parameter parabolic picker may be used. Orthorhombic projects require at least one iteration of orthorhombic model building. The first orthorhombic iteration will be the initial orthorhombic model building process, which defines the fast direction and gives initial estimates of the anisotropic parameters. Further iterations may run orthorhombic tomography to update the anisotropic parameters. TGS has mechanisms to compensate for the effects of both VTI and HTI anisotropy in time processing. These mechanisms correct for kinematic distortions (i.e., travel time perturbations), resulting in flatter gathers and a more focused stacked image. VTI anisotropy compensation is achieved via one of two mechanisms: higher order moveout or the so-called "eta" moveout correction. The higher order moveout correction entails retaining fourth or sixth order terms in the well-known Taner and Koehler (1969) power series expansion theory. Strictly speaking, the underlying theory is based on an isotropic earth; however, it is well known that the effects of intrinsic VTI anisotropy and isotropic vertical heterogeneity are hard to separate out on real data, and experience shows that picked interval velocities used in conjunction with a higher order moveout equation can serve as a proxy for both vertical heterogeneity and true anisotropy. The eta moveout equation is based on the work of Grechka and Tsvankin (1998) who added a third term (fourth order in offset) to the conventional NMO equation. Their equation accounts simultaneously for the effects of vertical heterogeneity and intrinsic layer anisotropy via inclusion of a new medium parameter (i.e., in addition to the conventional moveout velocity) called "effective eta". The eta moveout correction has been incorporated into both our NMO algorithm as well as our prestack time migration, while the higher order moveout correction exists within our prestack time migration only. Note that parameter estimation for either mechanism (i.e., higher order or eta) is performed using our interactive scanning tool which allows the user to scan through various trial percent velocity (and eta) scenarios and pick that velocity (eta) field which best flattens gathers and/or gives optimal stack response. One advantage of the higher order moveout scheme compared to the eta correction is that the former approach entails picking only one free parameter (stacking velocity which is internally converted to interval velocity), whereas the latter approach requires picking two parameters (short spread moveout correction and eta). Conversely, a relative disadvantage of the higher order moveout scheme is that the efficacy of the traveltime correction is sensitive with respect to errors in the underlying interval velocity field, a fact which may necessitate the use of a large velocity search range in cases where the reference (i.e., "100%") velocity model is far from the right answer. In isotropic media, seismic waves propagate at the same velocity, regardless of their direction. In anisotropic media, seismic wave velocity varies with direction. The most typical anisotropic media to consider are transversely isotropic (TI), where the velocity normal to the bedding is lower than along it, and which may be vertical (VTI) or tilted (TTI). Transverse isotropy is usually seen in situations with neatly ordered sedimentary layers. Orthorhombic anisotropy extends the TI model to allow for azimuthal variations in velocity. Orthorhombic anisotropy is often related to situations with anisotropic subsurface stress, such as in the presence of aligned fracture systems. Due to its relationship to fractures, orthorhombic models are appropriate and useful for land surveys of unconventional resources. Orthorhombic model parameters may serve as interpretable volumes describing fracture behavior. The offset-dependent picking code is preferred, but a two parameter parabolic picker may be used.